When I was a teenager I didn’t fit in. In fact, as soon as I realised that I wasn’t like most of the other kids, I actively tried to do everything I could do be different from “the norm”. I thought other people were sheep, and rebelled against wearing labels or doing anything that was seen as mainstream. 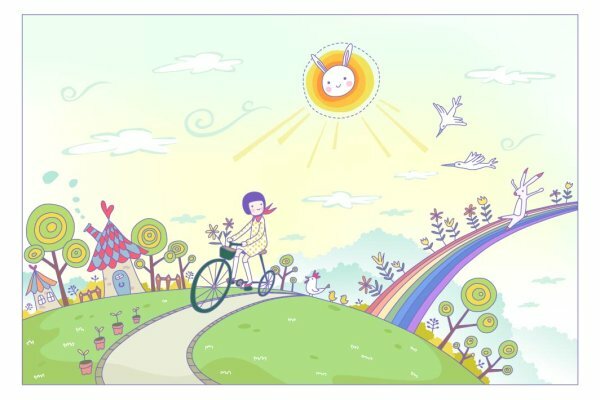 I dyed my hair every colour you can imagine, and got quite a lot of piercings. For anyone who’s interested, I looked like this. My friends and I used to talk about how one day the “freaks” like us would rise up against the rest of the people. I had dreams about people coming up out of the sea like an army of pirates, ready to stand together and do battle against the people who tried to put us down. I know now that I was just being a teenager, for the most part, but there is still an element of the non-conformist in me. 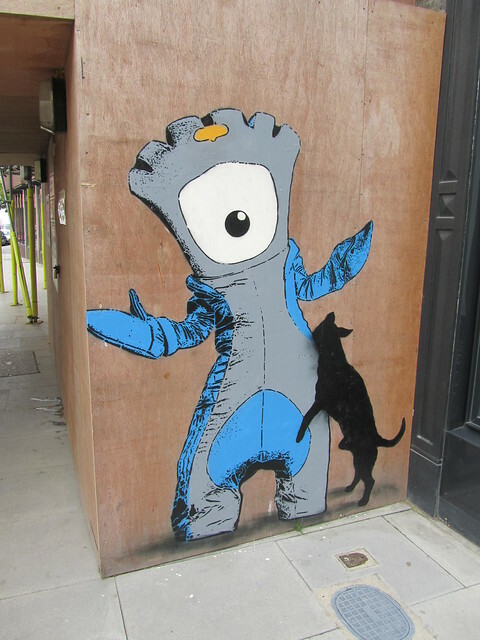 Today I spent most of the day in Shoreditch, and I had two things on my agenda: to attend the Whitecross Street Party, and to see the Olympic Torch Relay. 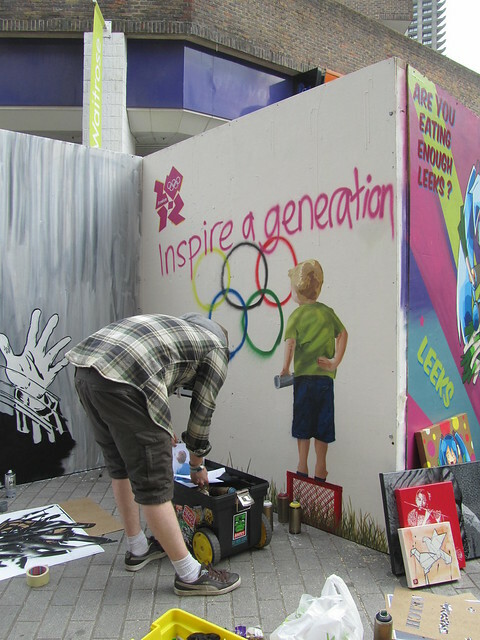 As I’ve mentioned on this blog before, I really don’t care much for the Olympics. However, I felt that, as I was going to be in the area, I really ought to try to make the effort to be interested and watch the torch go by. It was, after all, probably the only chance I would ever get. 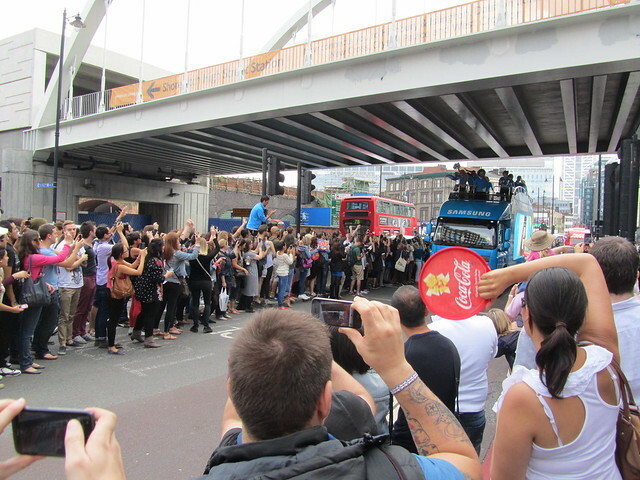 I arrived at Great Eastern Street about half an hour before the torch was due, and there were already people lining the streets. I tried to feel their excitement, but couldn’t quite get in the mood. People banged on Coca-Cola sponsored drum things that were being handed out, drank free Coca-Cola and waved flags. 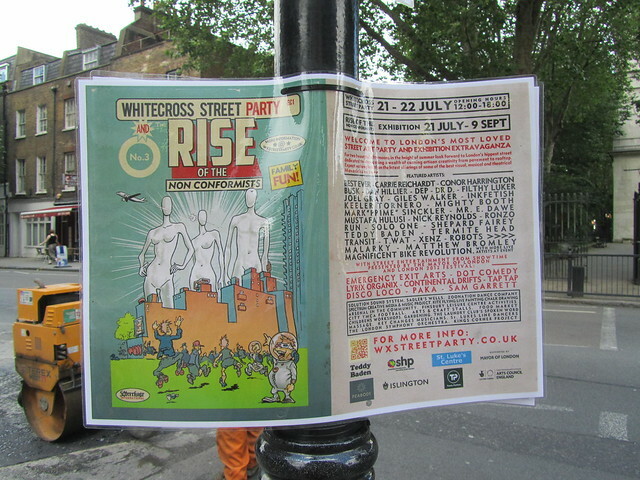 Prior to arriving, I had been at the Whitecross Street Party, dubbed “The Rise of the Non-Conformists”. 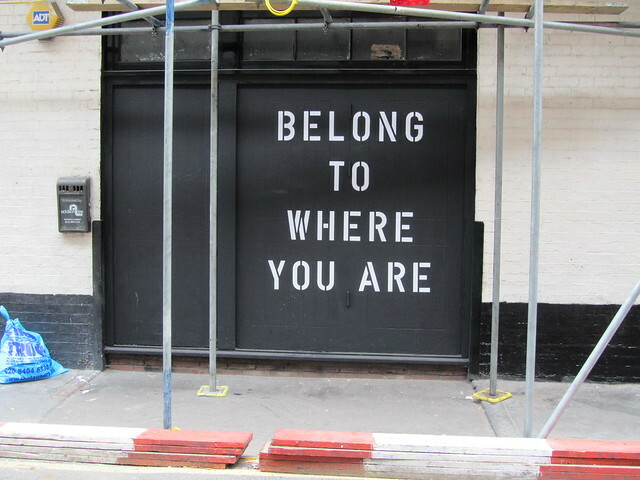 I had wandered up and down the street, happily snapping photographs of street art and artists at work, and generally soaking up the atmosphere. I chatted with the artist DON about his recent work and watched him stencilling a new piece out on the street. Then I popped in a gallery and a lovely girl dabbed glitter on my face and took my photo to put on Facebook, and I felt like I belonged. Standing waiting for the torch, I listened to some people talking next to me. They were full of almost obsessive excitement for the Olympics, and I felt like turning around and just asking them “why?”, but I didn’t. They wouldn’t have understood me any more than I understood them. When the torch came by, it was all over in a flash and something of an anti-climax. I barely saw the guy who was carrying it, and didn’t have a clue who he was anyway. 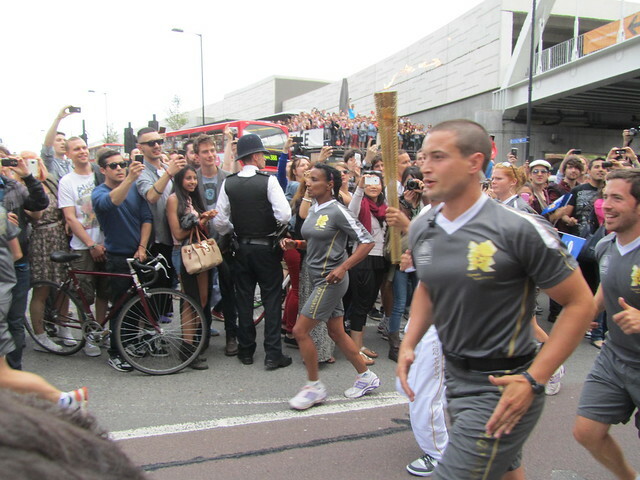 There goes the Olympic torch – shame you can’t see the guy carrying it! Enjoy the Olympics if that’s your thing, but these are my people, and this is where I’ll be. 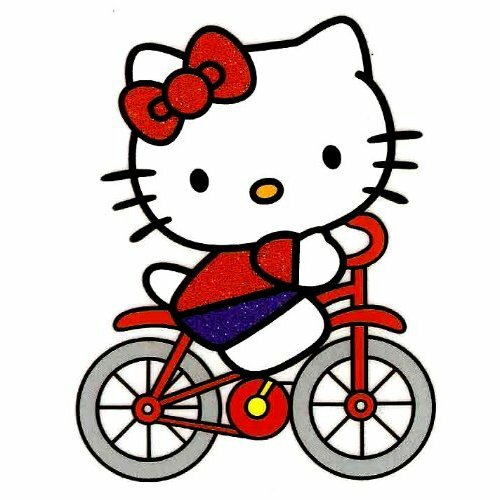 The Olympics are coming, and boy do we know it. Here in London it seems to be all anyone can talk about. Forgive me if I sound a bit bah-humbug, but I’m afraid it doesn’t interest me at all. Yes, I know most of you will probably ask “How can you not be interested?” and tell me things like “It will only happen once in your lifetime!” and “It’s going to be spectacular.” I’m not about to argue with you. You’re probably right that it will be spectacular and I’m sure I will never forget that London 2012 happened in my lifetime. I’m just saying, I’m not really interested and I’m not planning to watch any of the games. It’s simply not for me. I love London. It’s a brilliant, diverse place to live. Each area, north, south, east and west, and each of the 32 boroughs, has its own personality and character. 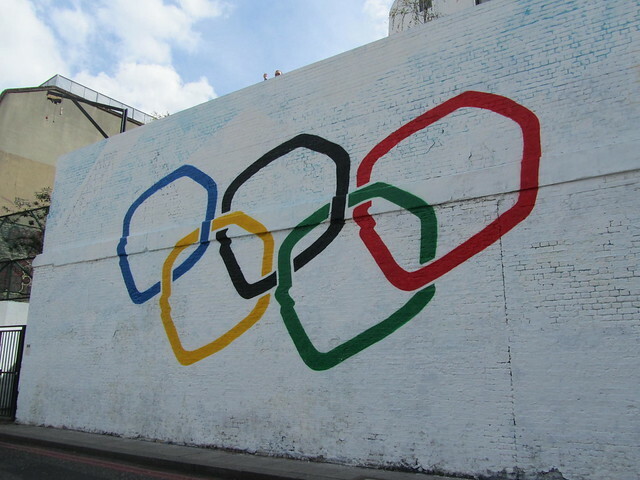 Whatever the Olympics brings with it, I have been crossing my fingers that it will only help to add more diversity and interesting culture to London. However, in a last-minute panic to “clean up” London, Hackney Council appear to be destroying the soul of my beloved Shoreditch. 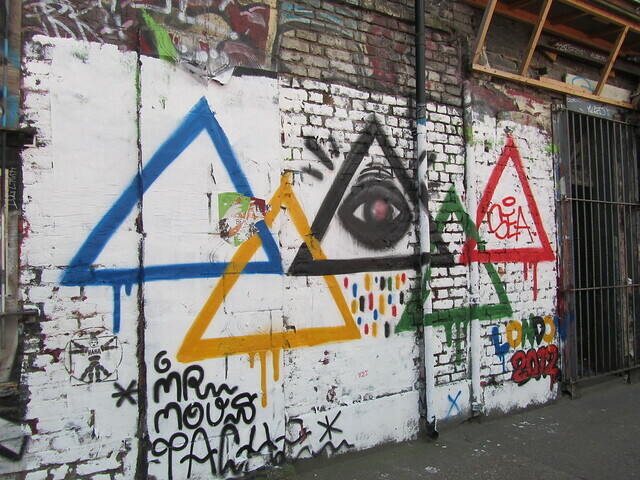 On Sunday I was having one of my wanders around the Old Street/Shoreditch area, looking for new street art, when I rounded a corner and saw something that made me sick to the stomach. Hackney Council vans parked up next to gleaming white walls. I don’t know the extent of the damage yet, but I can tell you for one thing that the piece below is gone, and that was enough to make me really angry. How dare they go around “cleaning up” the streets in this way, destroying art that has for so long made the area what it is? Who are they to decide what art should stay and what should go? 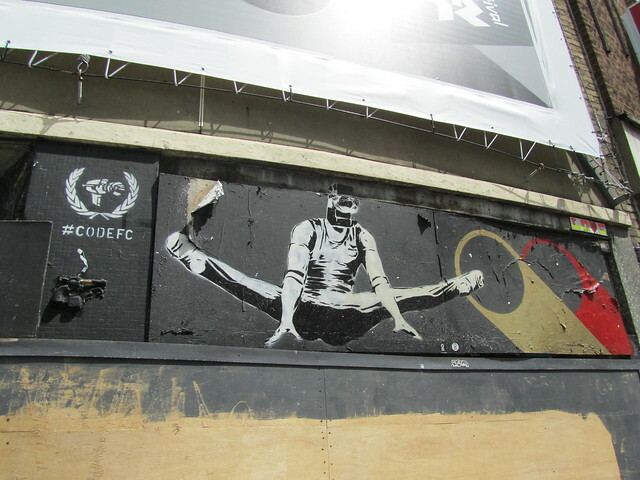 Not far from where this piece has been removed, I noticed a new mural by “Olympic approved” CODE FC on the somewhat questionable Shoreditch Ad Wall. 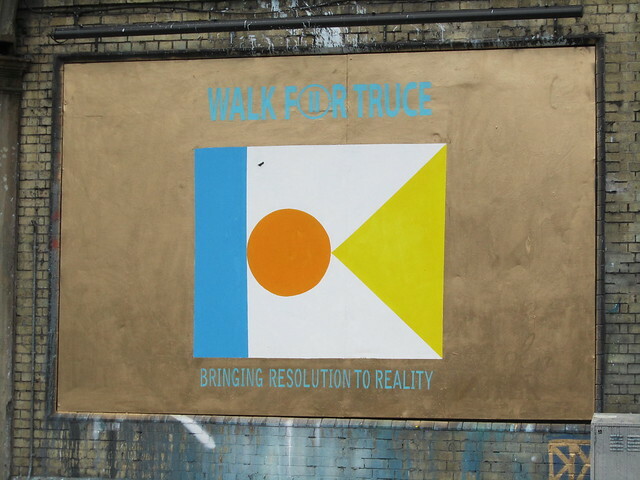 So graffiti artist CODE FC (who holds a degree in Public Art and Design from Chelsea College of Art) and graphic artist Jack Haslehurst (also from Chelsea College of Art) have participated in this ‘peace mural’ project, to celebrate Lord Michael Bates’ ‘Walk for Truce’ and broadcast Baroness Tanni Grey Thompson’s ‘Plight of Britain’s Disabled’ for the London 2012 Paralympics. 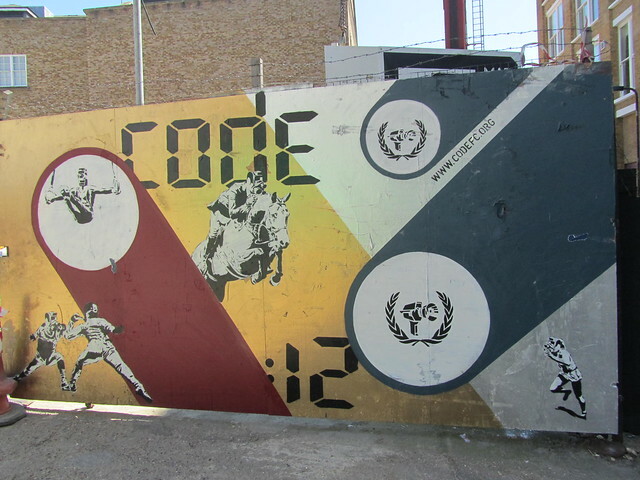 CODE FC, who had an exhibition entitled “20:12” at the Curious Duke Gallery in London in June, has been creating Olympic-themed street art for a couple of years. 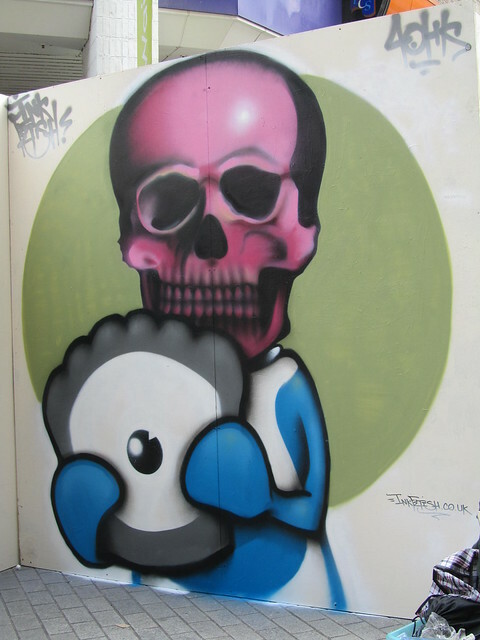 What I don’t understand is why his work is deemed acceptable (and, in fact, legal according to this article), and other artwork on the streets is being destroyed. For me, CODE FC’s work is pretty bland, although I guess the “cameras for heads” thing is making some comment about the media’s role in the Olympics. 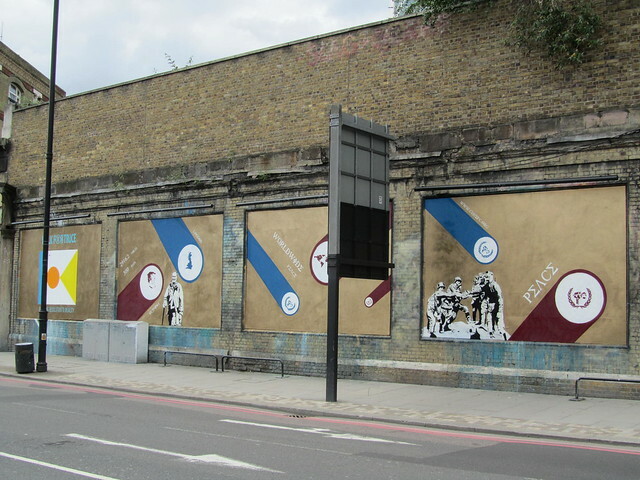 The mural is for a good cause, so I’m not saying it shouldn’t be there – I’d rather see this piece of art than some billboard featuring those bloody mascots or that awful 2012 logo – but why should CODE FC’s work be promoted in this way while the streets are being “cleansed” of other art which doesn’t quite fit the image the Hackney Council are trying to portray to the rest of the world? 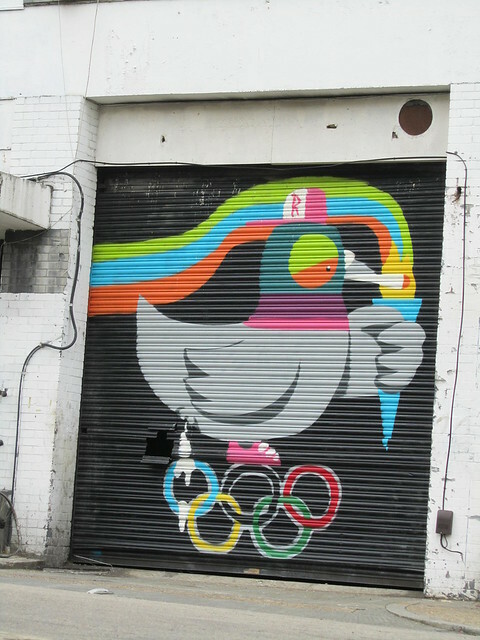 I wonder what would happen if Banksy decided to paint something for the Olympics? I suspect, like his Jubilee piece, a sheet of Perspex would be smacked over it immediately and people would flock to see it. 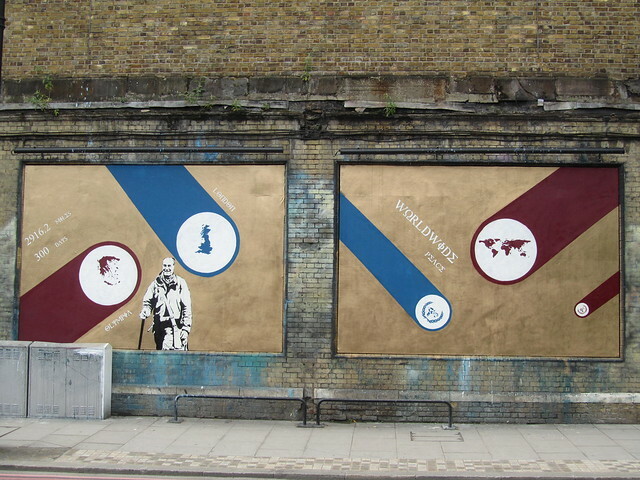 But what makes Banksy or CODE FC any different from Mighty Mo and Gold Peg, whose piece above was recently painted over? 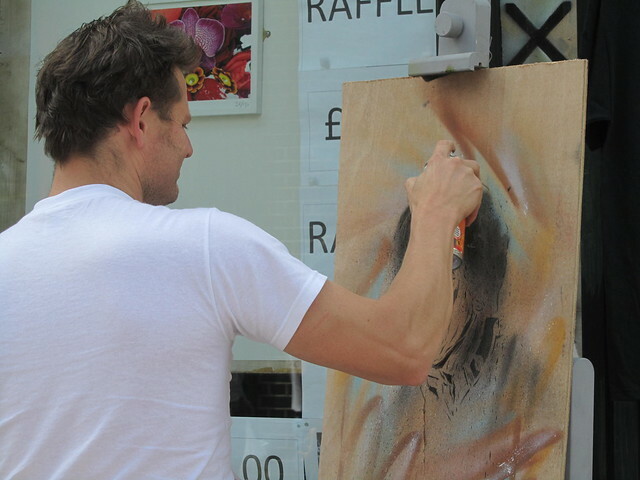 Surely the concept of “freedom of speech” should apply to the artists who work on the streets of London. I want to hear what they have to say – don’t you?